March – June: 10.00 am to 12.00 pm., Oct – Jan: 10.00 am to 4 pm(depending on weather condition). Medium Flight (10 to 15 mins or 25 to 30 min) and Cross Country Flight (30 to 45 mins). During the time of flying you need T shirt, Denim / Cargos/ Track pants or any comfortable lowers with shoes. No sandals or floaters or slippers are allowed. Windcheater, Jackets depending on weather. All the customers are requested to sign the assumption of risk and release bond before undertaking the trip. All customers are to carry their proof of identification. Foreign nationals are to carry their passport and visa. Taxi from Kalimpong to start point about Rs 150 (one way). 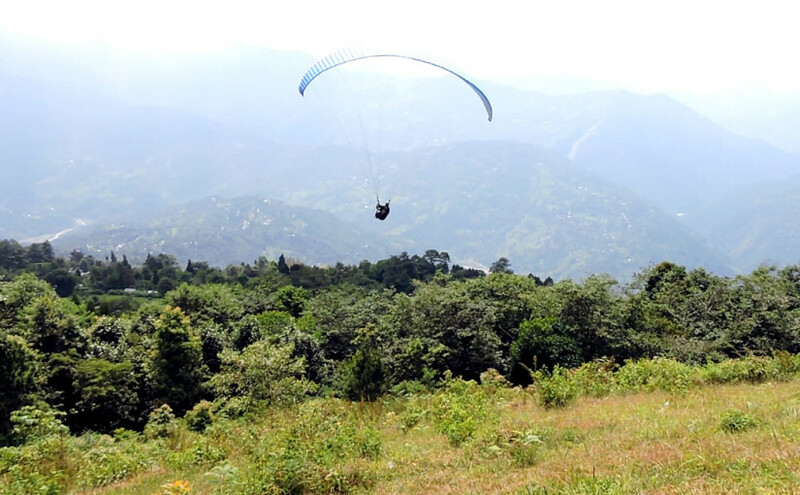 Several tour companies like Gurudongma Tours, Treks and Himalayan Bike Tours, Alpine Paragliding and few agencies are offering paragliding packages. Prasant Rana is an ex-service man (Indian Army) from the Parachute Regiment (Commando, Special Force). He has immense experience in Parachuting, Paragliding, Para motoring and Parasailing. Note: You should be at least 30 kg regarding weight and maximum is 120 kg. And customers shouldn’t have any Heart problem, epilepsy, expecting mothers, those with serious ailments and Asthma issues. 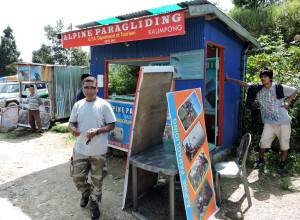 This entry was posted by indispottravel in Adventure Sports in west bengal, Paragliding in West Bengal, West Bengal and tagged Cost of reaching to Paragliding point in Kalimpong, Fly within the Himalayas, How to reach at Paragliding point in Kalimpong, Kalimpong, Paragliding agencies in Kalimpong, Paragliding flying type in Kalimpong, Paragliding in Kalimpong, Paragliding in Kalimpong Cross Country Fly, Paragliding in Kalimpong Dress Charges, Paragliding in Kalimpong Dress Code, Paragliding in Kalimpong Dress Formalities, Paragliding in Kalimpong Duration, Paragliding in Kalimpong high Fly, Paragliding in Kalimpong Medium Fly, Paragliding in Kalimpong Timing, Paragliding in West Bengal, Paragliding landing on Dr. Grahams Homes School in Kalimpong, weather of Paragliding in Kalimpong, West Bengal.